Contents: 80 pages, photographs, colour plates. EagleFiles #2 "Yellow 10" by Jerry Crandall deals with the history of the ultra-rare Focke-Wulf Fw 190 D-13 "Gelbe 10". EF #2 is presented on 87 pages of high quality glossy paper. The book includes 23 color profiles and illustrations as well as 7 b/w profiles by Thomas A. Tullis covering all the subject aircraft of the book (see below). The profiles are simply superb and painstakingly well researched. The author also includes 70 b/w photographs which show the aircraft in both war time and post-war time. Some photographs display the complex camouflage scheme of Yellow 10 very well. These include some of the best detail shots of a Fw 190 D-series that I ever have seen. They show both external and internal details, e.g. the rivets and panels of the fuselage, the MW 50 tank in the rear fuselage, wheel well details, engine details, the unpainted natural metal interior and a lot more. Another great feature of the book are its 8 1/48th scale drawings by Koichiro Abe. 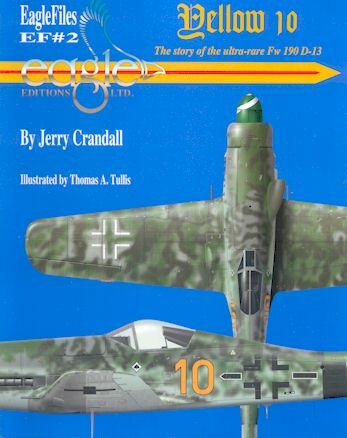 Jerry Crandall´s writing is precise and filled with passion for "his" Focke Wulf. Jerry takes us on a journey back into the 60`s where he first met "Yellow 10". 8 color photographs relate the sad post war story of the bird. Thankfully, the story has a Happy Ending. As a modeler I love two further features of this magnificent book. Jerry includes a table that lists all differences between the D-9 and D-13 series. You therefore have instant access to all important facts when you´re planing to build some of these "hot rods". The second gem is a succession of color profiles which shows the camouflage painting sequence separated by color application in 5 steps. The sequence starts with the factory painting and ends with the final field applied camouflage and markings. Fw 190 D-12 Factory Prototype V63 W.Nr. 350165 coded "CS+IA"
Bf 109 G-10/U4 "Black 2" W.Nr. 610824 of II./JG 52. This is a fantastic book for all Luftwaffe fans. It is a must for all Dora lovers and especially a must for the modeler of the Dora series. EagleFile Books and EagleCals decals are available from Eagle Editions Website or Hobby Retailers.